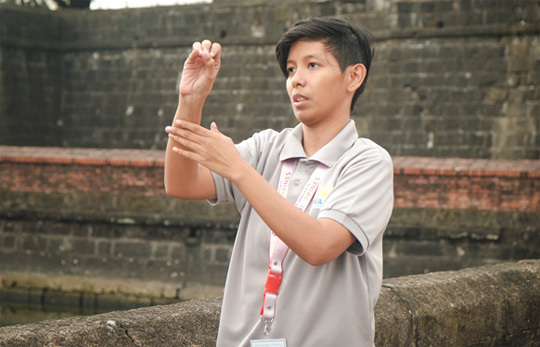 The deaf and hard of hearing can now appreciate what Manila has to offer through the first-ever specialized tour by the Department of Tourism’s newly accredited Deaf Tour Guides. SDEAS alumna Catherine Ballen is one of the DoT-accredited deaf tour guides. The program was made possible in collaboration with DLS-CSB’s Center for Partnership and Development. “Here in CPD, we focus on always finding the perfect match between an organization and the deaf. It could be in terms of employment, advocacy, entrepreneurship, or other services,” said deaf career coach Veronica Camba. In a statement, Tourism Secretary Bernadette Romulo-Puyat said the project seeks to give training for deaf individuals to become tour guides for deaf visitors. “Having tour guides skilled with the knowledge of sign language and an understanding of the services needed by persons with disabilities is a must under the DoT’s thrust for barrier-free tourism. Not only will this provide quality service to tourists with special needs, but more importantly, this will create opportunities, which are the very essence of an inclusive tourism industry,” expounded Romulo-Puyat. The Department of Tourism, in partnership with Benilde's School of Deaf Education and Applied Studies, has launched the first specialized tours headed by DoT-accredited deaf tour guides to help the deaf and hard of hearing better appreciate the beauty of Manila. DoT Office of Industry Manpower Development director Nelly Dillera shared their office is currently working with DLS-CSB to widen the range of community trainings and hopefully implement it in other regions. The pioneer members of the Deafinite Tour Guiding Service, a non-profit, professional organization consisting of DoT-accredited deaf tour guides are 13 Benilde SDEAS alumni. The group is composed of Catherine Ballen, Shiela May Tenorio, Mona Liza Arienza, Cecile Ruth Arreola, Marie Justine Castro, Brion King Lasutaz, John Melvin Orevillo, Emerson Tabunan, Jeremiah Viernes, Christine Ella Castañeda-Nallos, John Alexis Abad, Jeanalyn Umali, and Jamilla Angela Angela Aquino. They aim to make tourism in Manila accessible to deaf guests, both foreign and local, by imparting everything Filipino through sign language. For their first fieldwork, they assisted 30 students from the Philippine School for the Deaf during an inclusive tour around the capital’s top destinations such as Rizal Park, National Museum, and Fort Santiago. Ballen, one of the deaf tour guides, recalled how her interest was piqued when SDEAS called for trainees through a Facebook post. “SDEAS gives career opportunities for the deaf and by letting us apply through email and social media, we were able to train under DoT and obtain the position as tour guides,” she beamed. 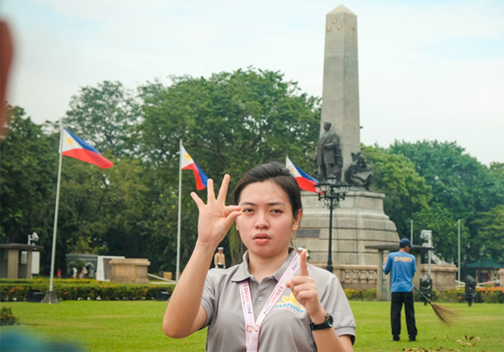 Deaf tour guide Shiela May Tenorio explains to guests important information about Rizal Park. “This initiative is a great introduction to the success of the Deaf community,” she added.